From a smartphone marketshare standpoint, we all know by now that Android OS has the dominant position over Apple. The strategy from Android is simple, build an OS (operating system), and then let multiple smartphone manufacturers adopt. Apple, on the other hand, takes a more centric approach to design and integration by releasing and focusing on just one operating system – iOS. Apple will simply update the iOS with new releases without ever compromising the structural operation of the iOS. The strategies from both companies are heavily debated as to which one is better. 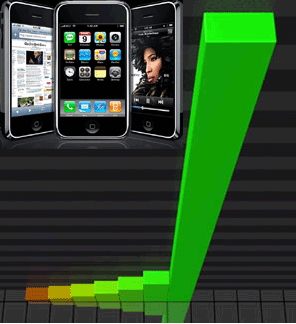 But one thing is certain, the Apple iPhone is exploding ahead of all other smartphones in terms of global shipments. FRAMINGHAM, Mass. July 28, 2011 – The worldwide mobile phone market grew 11.3% year over year in the second quarter of 2011 (2Q11), despite a weaker feature phone market, which declined for the first time since 3Q09. According to the International Data Corporation (IDC) Worldwide Mobile Phone Tracker, vendors shipped 365.4 million units in 2Q11 compared to 328.4 million units in the second quarter of 2010. The 11.3% growth was lower than IDC’s forecast of 13.3% for the quarter and was also below the 16.8% growth in 1Q11. The feature phone forecast isn’t expected to be any rosier in the quarters and years to come. Shipment growth of the device type won’t exceed 1.1% in any year forecasted by IDC. The traditionally slow second quarter in Asia/Pacific was exacerbated by Nokia’s channel inventory corrections in China. Apple thrived in China thanks to strong iPhone 4 demand. As well, a number of domestic brands in Southeast Asia like CSL, Nexian, Q-Mobile, and Wellcom grew sales of Android-powered smartphones. China-based vendors gained share in India and Southeast Asia at the low end. In Japan, the impact of the earthquake continued into April and May as component shortages forced manufacturers to release new models in June while customer demand was harder to fulfill. In Western Europe, the market declined sequentially compared to the first quarter. The feature phone market declined while smartphone shipment growth slowed as phone makers and carriers reduced inventories in advance of expected third-quarter product launches. Feature phone dependent suppliers were not able to offset feature phone weakness completely with higher smartphone sales. TheCEMA markets performed well on a year-over-year basis despite civil unrest in Egypt and other Arab countries, where sales were negatively impacted as a result. Samsung gained share while Chinese brands continued to make inroads in the region. Nokia’s hold on the top global mobile phone spot weakened last quarter as inventory buildups in traditional strongholds, namely China and Europe, led to sharp year-over-year shipment declines. Nokia’s global feature phone and smartphone businesses suffered a similar fate. One positive sign for Nokia last quarter were dual-SIM devices; the company shipped over 2.6 million of these in the second quarter. Over the long term, Nokia’s smartphone fortunes will be dictated by its ability to sell Windows Phone 7 smartphone devices, which are expected to hit the market this year. It is Nokia’s primary smartphone platform of the future. In the meantime, Nokia is trying to sustain shipment volume with low-cost mobile phones and devices powered by the aging Symbian smartphone platform. Samsung posted double-digit growth from the same quarter a year ago, and just slightly slower growth than the overall pace of the market. Like other vendors it realized a decrease in demand for its feature phones, but made up the difference with continued success for its Android-based Galaxy smartphones. The difference between Samsung and market leader Nokia continued to shrink, with less than 20 million units separating the two vendors, mostly resulting from Nokia’s struggles in the market. Still, Samsung expects continued growth into the second half, which could put it in closer contention with Nokia. LG Electronics held on to its number three position during the quarter, thanks in part to its Optimus smartphone sales worldwide. However, a combination of factors – including soft demand for its feature phones, slow pace of smartphone releases, and competitive pressures, led the company to downgrade its outlook for the year by 24%. Originally, LG had anticipated flat growth in 2011 from 2010 levels, even as it expected the overall market to increase by 8%. Should LG’s volumes decrease as much as it anticipates, other vendors may jockey for position ahead of LG. Apple maintained its number four position overall but closed the gap on Top 5 competitors thanks to another record unit shipment quarter. The company easily posted the highest growth rate of the worldwide leaders despite the fact that its flagship iPhone 4 is now more than a year old. The triple-digit shipment volume growth allowed Apple to more than double its share when compared to the same quarter last year. Apple’s ability to bring its smartphone momentum to developing economies, where it’s less successful, will help dictate the company’s smartphone fortunes in future.